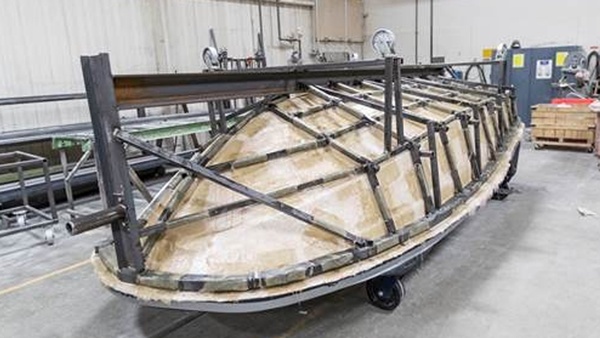 A 3D printed boat hull pattern has been completed on the Thermwood LSAM and successfully used to produce a production capable fiberglass mold. 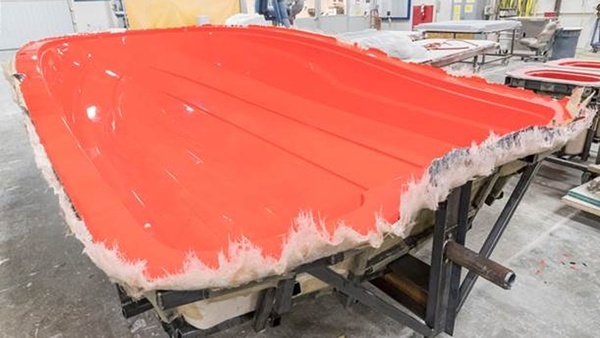 A 3D printed boat hull pattern, from which fiberglass boat hull molds are made, has been completed using a near net shape additive manufacturing process and then successfully used to produce a production capable fiberglass mold in a proof of concept joint evaluation program. The completed pattern was recently displayed at the AM2017 Additive Manufacturing Conference in Knoxville, Tennessee. This achievement was the result of a collaborative effort between Thermwood Corporation,Techmer PM and Marine Concepts. 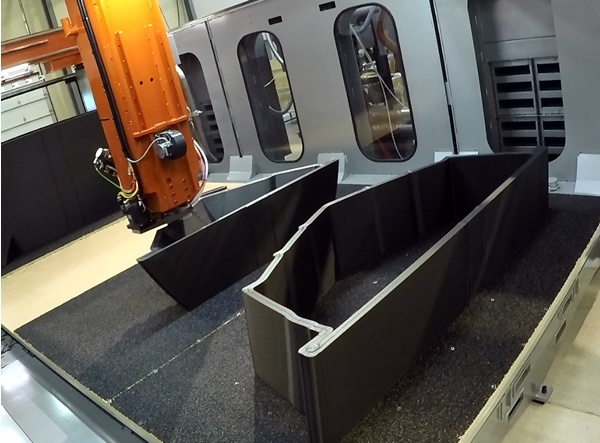 The tool was printed slightly oversized and then trimmed to final net size and shape using a Thermwood’s large scale additive manufacturing (LSAM®) system. It was made from Techmer’s Electrafil© ABS LT1 3DP, which has proven ideal for marine tooling applications when processed using LSAM print technology. The entire print, assembly and trim process required less than ten working days to complete. After the printed and trimmed tool was coated and finished, a fiberglass mold was produced using the printed pattern. 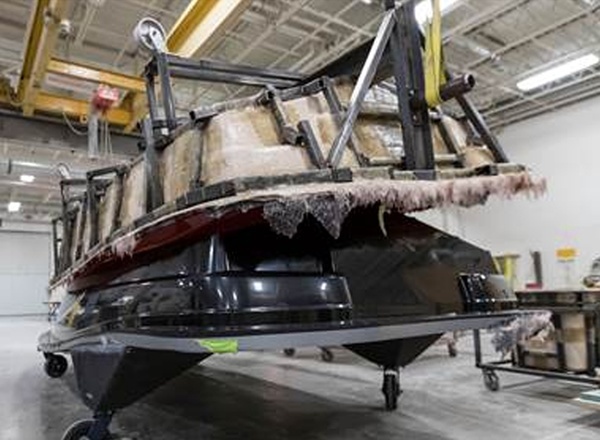 This effort clearly demonstrates the feasibility, practicality, economics and advantages of using additive manufacturing in the production of boat tooling. 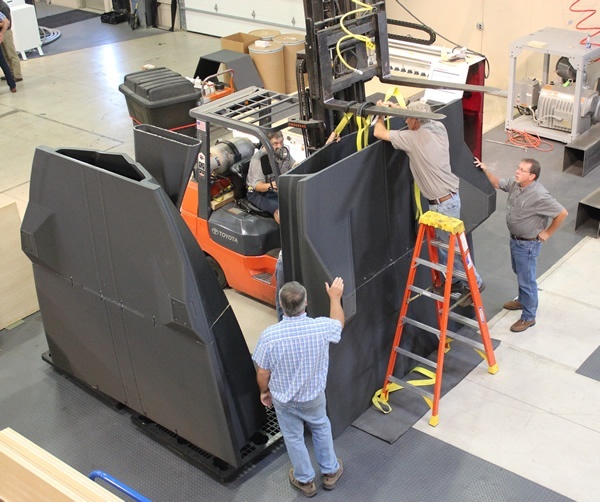 The final tool was printed in six sections, four major center sections with walls approximately an inch and a half thick and a solid printed transom and bow, which were pinned and bonded together using Lord plural component urethane adhesive before being machined as a single piece on the Thermwood system. The final trimmed pattern weighs approximately three thousand pounds. It required approximately thirty hours to print and fifty hours to machine. 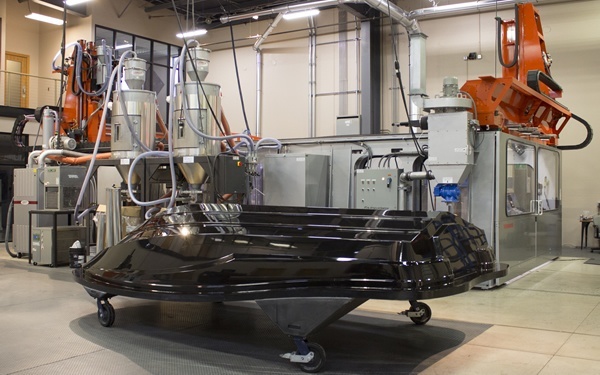 Thermwood’s demonstration machine, used for this program, has a 10 foot by 20 foot worktable and features both print and trim capability on the same machine. The print head used for this project can print at rates approaching 200 pounds an hour when running this particular Techmer material. 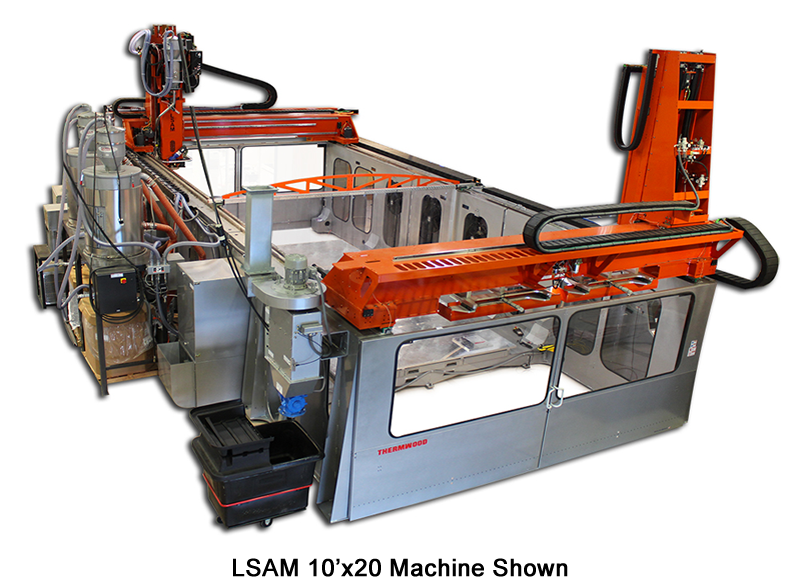 Thermwood also offers larger machines and higher throughput print heads as part of its LSAM product line. 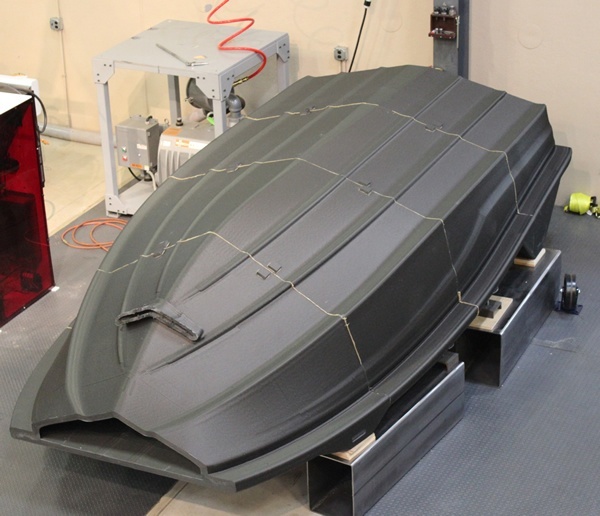 Additive manufacturing offers the promise of even more advances in marine tooling such as printing the hull and deck pattern as a single piece, allowing a production mold to be taken from the hull and then flipping the pattern over and taking a deck mold from the other side of the same pattern. All of these possibilities result in dramatically lower tooling cost and substantially faster build time. 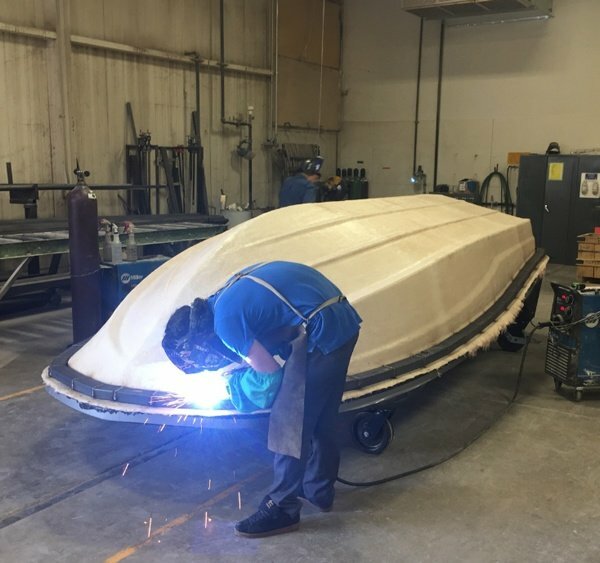 For large boats and yachts, Thermwood is evaluating the feasibility of printing molds directly, rather than printing a pattern from which the mold is taken. Because of their large size, these tools will need to be printed and machined in sections, even with very large LSAM® printers. It may also be possible to print integrated cooling channels for air or liquid into these large tools as part of the print process. 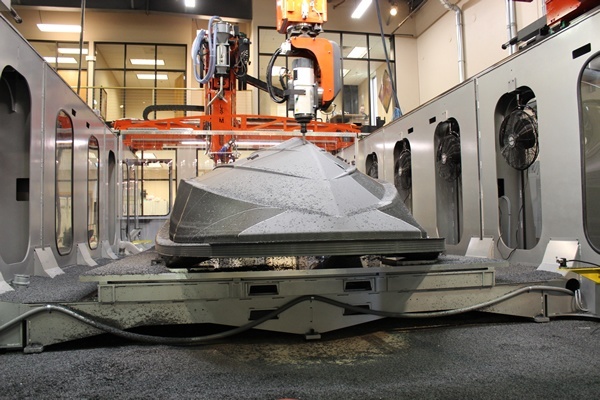 With this initial success and some radical new ideas that appear to be possible with current materials and technology, it is becoming apparent that additive manufacturing may very well represent a disruptive force for the marine tooling industry. You received this email because you are subscribed to Marketing Information from Thermwood Corporation .